GeForce RTX™ 2080 Ti is light years ahead of other cards, delivering truly unique real-time ray-tracing technologies for cutting-edge, hyper-realistic graphics. Powered by NVIDIA Turing™, GeForce RTX™ 2080 Ti brings the power of AI to games. NVIDIA’s newest flagship graphics card is a revolution in gaming realism and performance. 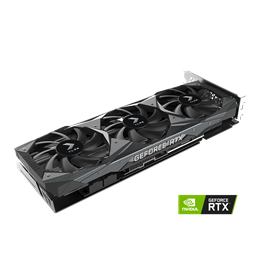 Its powerful NVIDIA Turing™ GPU architecture, breakthrough technologies, and 11 GB of next-gen, ultra-fast GDDR6 memory make it the world’s ultimate gaming GPU. GeForce RTX™ graphics cards are powered by the Turing GPU architecture and the all-new RTX platform. This gives you up to 6× the performance of previous-generation graphics cards and brings the power of real-time ray tracing and AI to games. When it comes to next-gen gaming, it’s all about realism. GeForce RTX 2080 Ti is light years ahead of other cards, delivering truly unique real-time ray-tracing technologies for cutting-edge, hyper-realistic graphics.